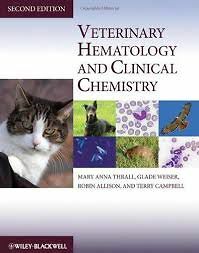 Veterinary Hematology and Clinical Chemistry, Second Edition is a well-illustrated, user-friendly reference on veterinary laboratory diagnostic techniques and interpretation. Covering both hematology and chemistry for a wide range of species, including birds, reptiles, amphibians, and fish, the book provides an overview of these critical veterinary skills. This Second Edition includes many revisions and additions, including new chapters on molecular diagnostics of hematologic malignancies and lipid pathology, updates to reflect advances in diagnostic instrumentation and capabilities, significant revisions to the data interpretation chapter to provide introductory guidance, and current information on immunodiagnostics and laboratory diagnostics of renal, endocrine, and calcium metabolic pathologies. Beginning with the basic principles of laboratory testing and diagnosis, the book moves into in-depth information on hematology and chemistry of common domestic and non-domestic species. Clinical case presentations, supplying case data and offering narrative discussions to promote skills, have been expanded and incorporated into the body of the book. Packed with useful information for veterinary students, technicians, pathologists, and researchers, Veterinary Hematology and Clinical Chemistry is an essential addition to any veterinary library.